Did you know that I had never really eaten seafood (fish sticks aside) until I starting dating Jeff? I just always thought it smelled bad or was gross because it used to swim. When I started dating Jeff he turned me on to what really good fresh seafood could taste like and I fell in love. For the longest time I would only order it in restaurants because I was too scared to make it at home. Then when we would cook a piece of fish at home it was always the same, grilled with some lemon. But over the past few years I have gotten more confident in my cooking skills and like to try to take some risks and come up with some really good recipes. 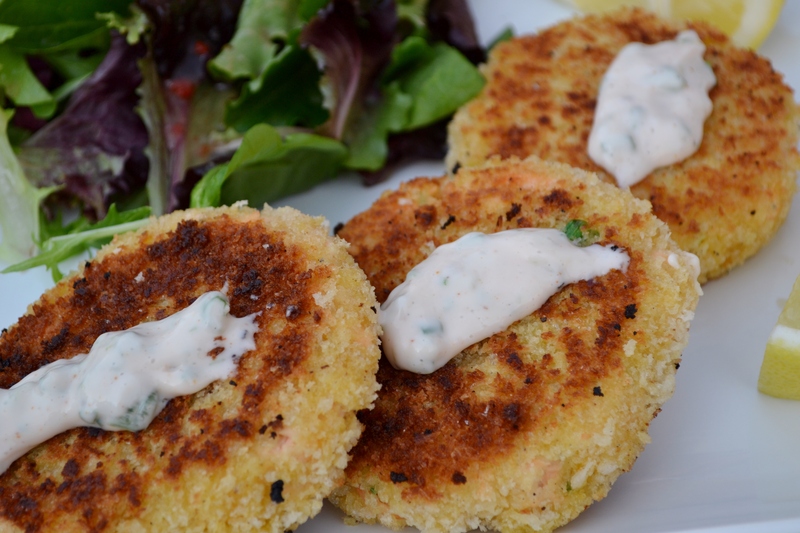 When I finally perfected this salmon cake recipe it quickly became one of our absolute favorites and it often leaves Jeff begging for me to make it! 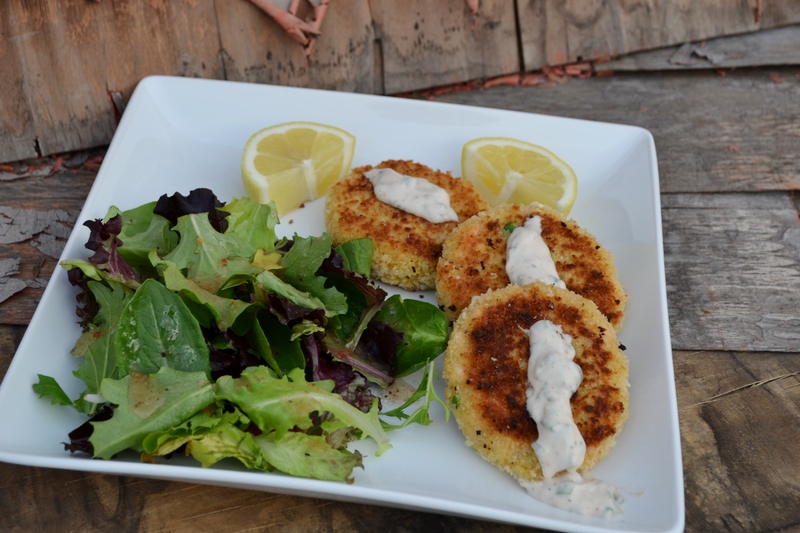 (Recipe at the bottom) Start by throwing all the ingredients for the salmon cakes into a big bowl and mix it all up breaking up the salmon with a fork. You don’t want to pulverize the salmon but make sure the chunks aren’t too large or they won’t stick together. If your salmon was already chilled then you are ready to go, but if your salmon is still warm, then put this in the fridge to get cold. Next throw all the ingredients for the sauce in a bowl and mix it up. Throw this in the fridge to stay cold until you are ready to serve. 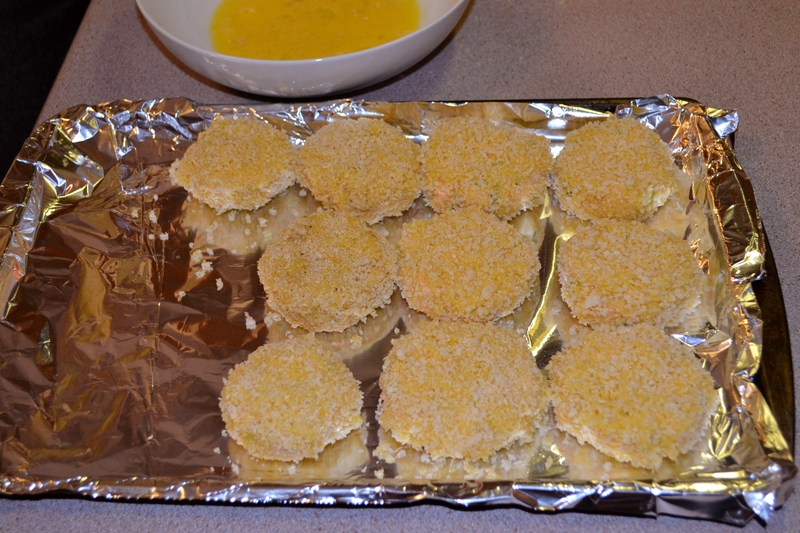 Then get your little salmon cake making station all set up with the salmon mixture, panko bread crumbs, egg, and a place to put them when you are done. Prepare to get messy. 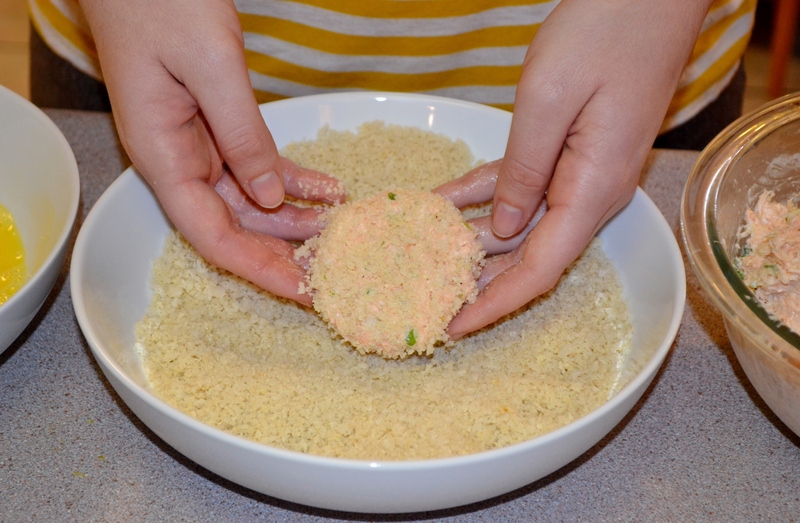 Start by forming the salmon mixture into a little cake just smaller than the palm of your hand. The cake will get bigger with the layers of breading so you don’t want it to start off too big. Then coat it with the bread crumbs. It should stick nicely because the cake itself is semi-wet from the miracle whip. Then back into the panko mixture. Then set it aside while you make the rest. Heat a pan to medium heat and fill it with just enough oil to cover the bottom of the pan. I usually use olive oil but vegetable oil would work well to. 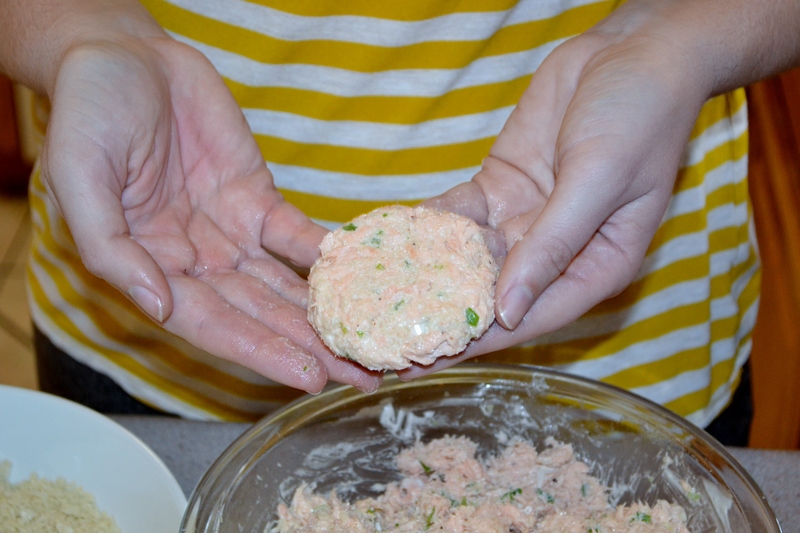 When you put the salmon cake into the pan, give it a little smash with your spatula to flatten it out a bit. This ensures the oil will cook the egg all around. When they’re golden brown give the a flip and cook the other side. 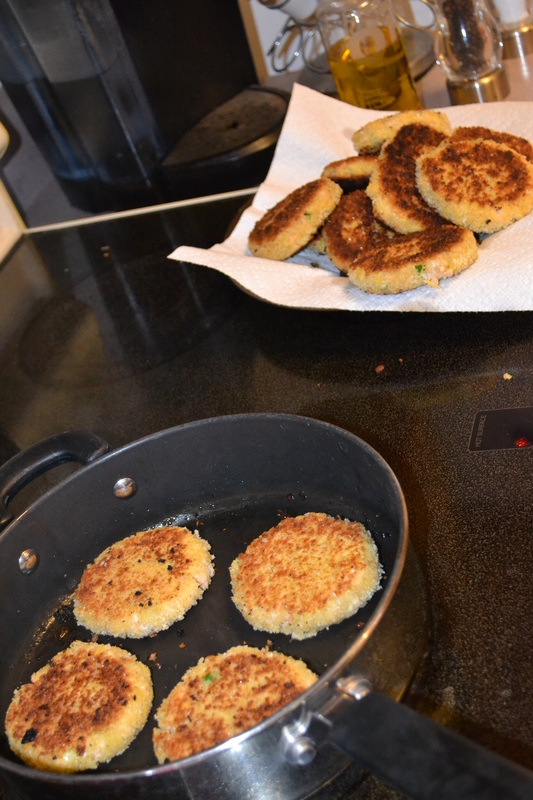 The salmon cakes continue to cook for a few second more even after they are out of the pan so don’t be afraid to take them out just before perfect because they continue to get brown. Place them on a paper towel to soak up any excess oil while you finish browning the batch. 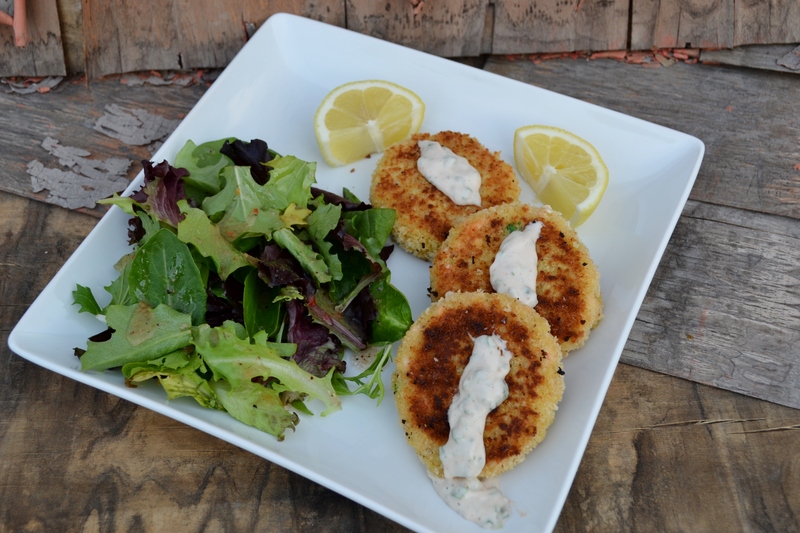 Serve them warm with a little dab of that zesty sauce and a slice of lemon. I usually serve them with a leafy green salad and an italian dressing in the summer. In the winter I’ll serve it with some cous cous. Now that is a delicious homemade meal right there! I actually just eyeball everything when it comes to this recipe. 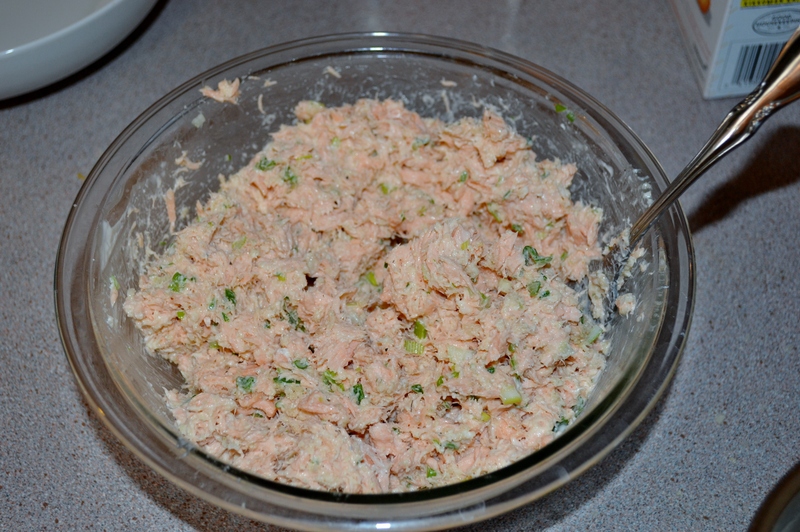 I want the salmon mixture to be moist but not so wet that it won’t stick together. (On the flip side you also don’t want it to be too dry). If you added too much mayo (or in my case miracle whip) just throw in some more panko bread crumbs to soak it up. 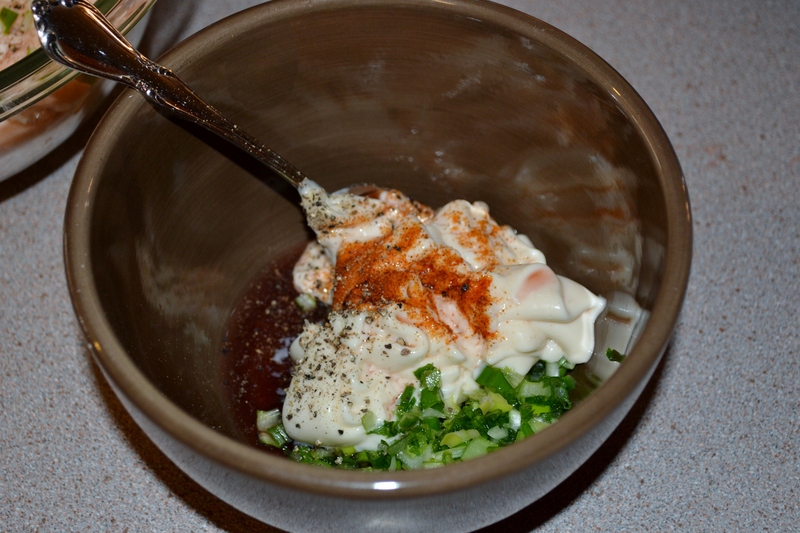 When the salmon mixture is really cold it helps everything form together better as well. 1. 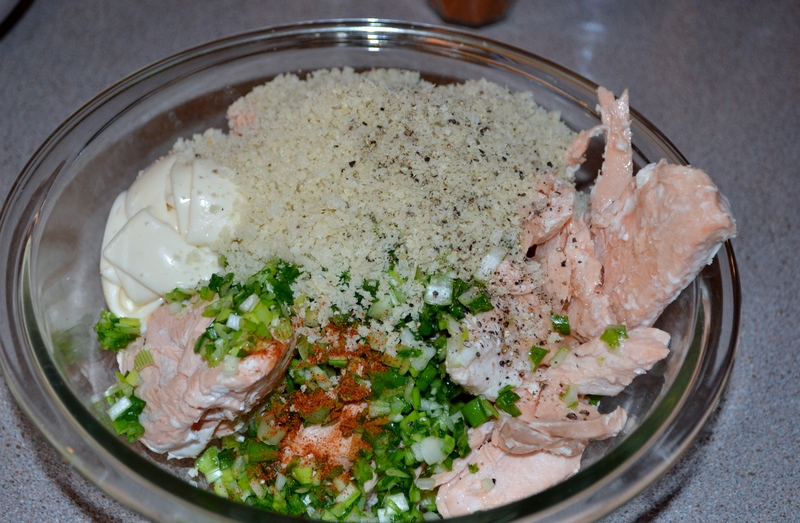 Flake the salmon into a large bowl. 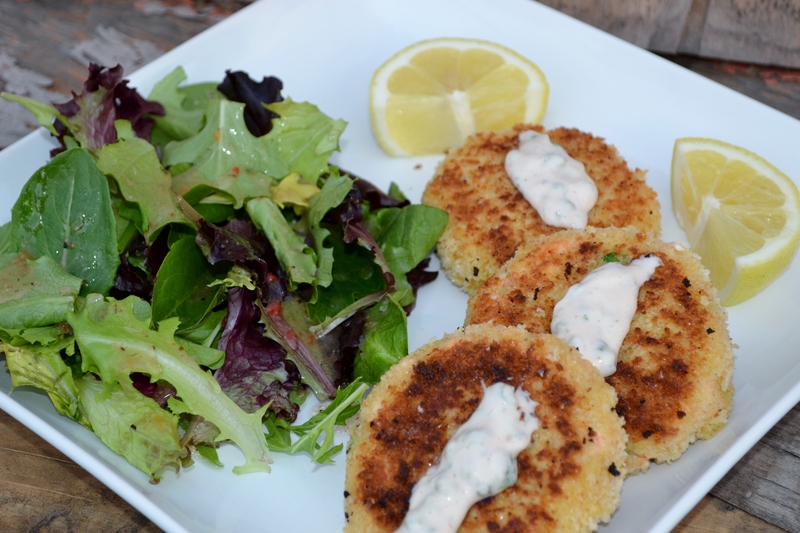 Using a fork, mix in 1/2 cup panko, some of the scallion, 2/3 cup mayonnaise, 1/2 teaspoon salt, a pinch black pepper and the cayenne. Refrigerate for 30 minutes. 2. Form the mixture into 8 patties about 1 inch thick. 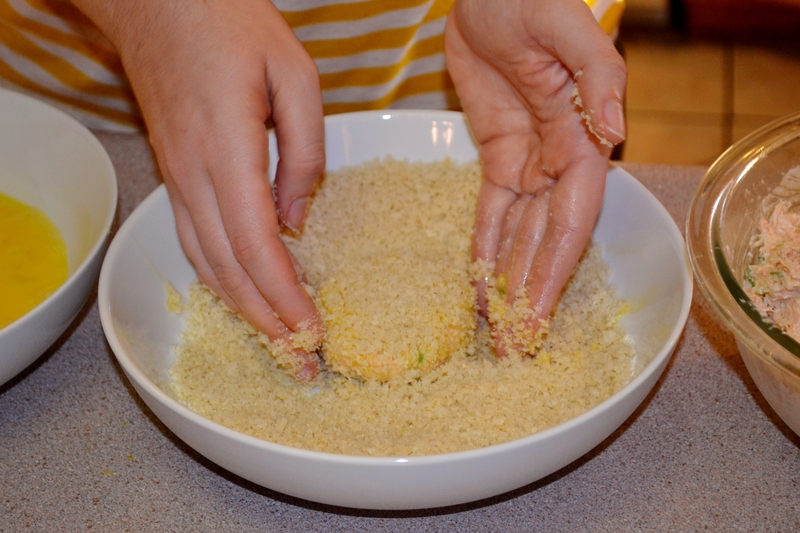 In a bowl, mix the remaining 2 1/2 cups panko with 1 teaspoon salt. 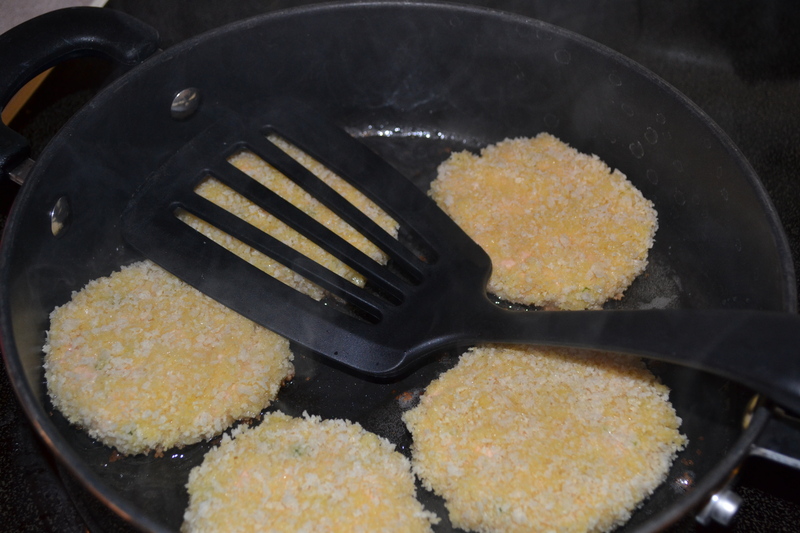 Coat the patties with the panko, then the eggs, then the panko again. 3. In a heavy skillet, heat half of the olive oil over medium heat. 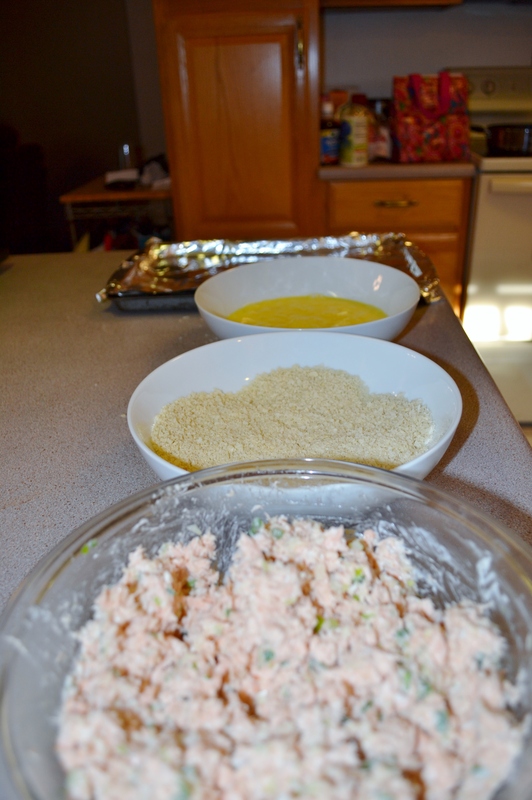 Add 4 salmon patties and cook until golden, about 3 minutes per side. Drain on paper towels. Repeat with the remaining oil and patties. 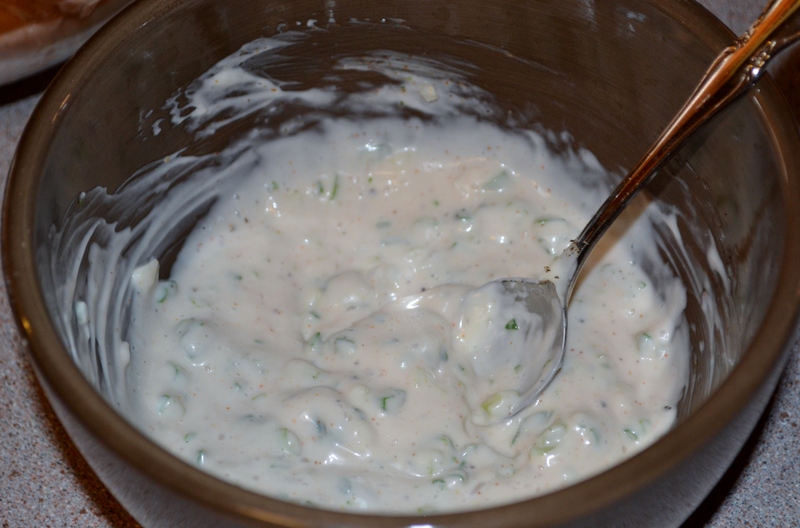 Combine the remaining 1/2 cup mayonnaise, the vinegar and 1/3 cup scallion; season with salt and pepper and a pinch of cayanne. 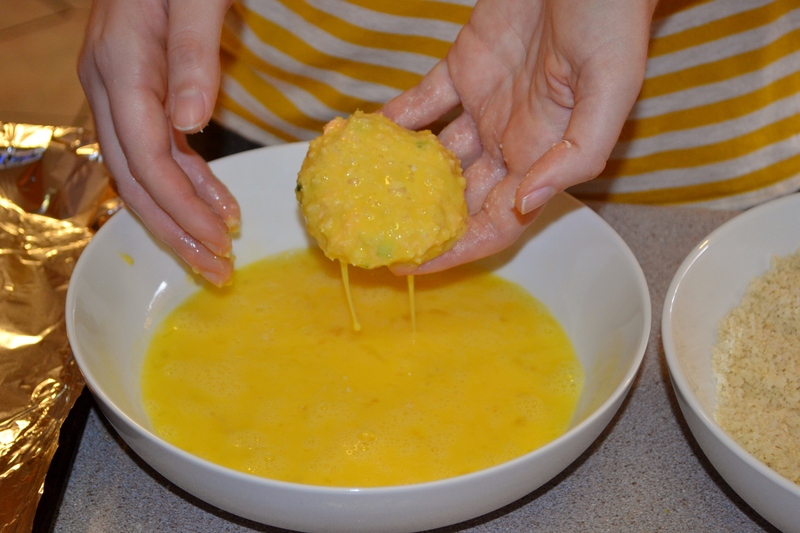 Serve 2-3 cakes per person with the sauce alongside.